Bio: Born in France, Sylvain began his artistic pursuits in visual arts at Bordeaux’s School of Fine-Arts. Influenced by Post-Modern dance artists, he turned to the world of contemporary dance. He studied at P.A.R.T.S, a school founded by Belgian choreographer Anne Theresa de Keersmaecker, where he danced the repertory of Trisha Brown, William Forsyth and Pina Bausch. He then moved to Paris to further his studies in contemporary dance and somatic education. Major artistic influences include Katie Duck, Meg Stuart, Jose Cazeneuve, Peter Goss, Vera Mantero and Meredith Monk. He has studied Body Mind-Centering® and Feldenkrais, QiQong with Master LiJunfeng, and Continuum Movement with Emilie Conrad. 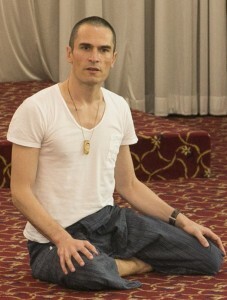 In April 2014 he received a Master’s degree in Dance Therapy from CODARTS, Netherlands. Two months later, he partook in Continuum’s Wellsprings practitioner program.